To try design something in stained glass crochet has been on my to-do list for a long time. What is “stained glass crochet” you may wonder. 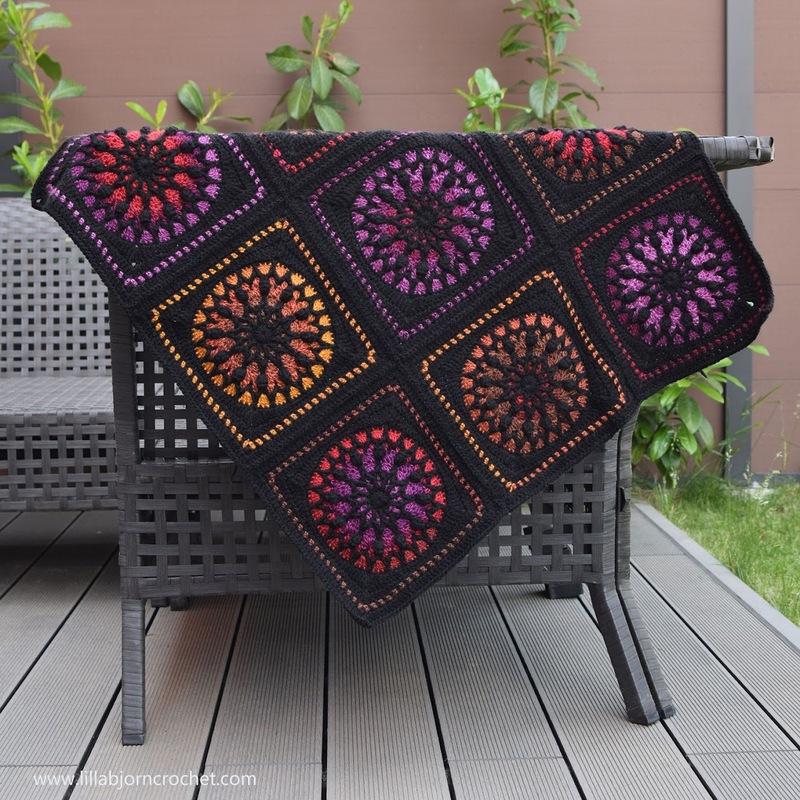 This category doesn’t exist officially (though I think it must be introduced as a separate and unique type of crochet), but usually these are crochet projects with one main color for patterning and different colors for the background. Just the same as in traditional stained glass craft. Cathedral windows are perfect examples. And I have always thought they would look fabulous when translated into crochet. 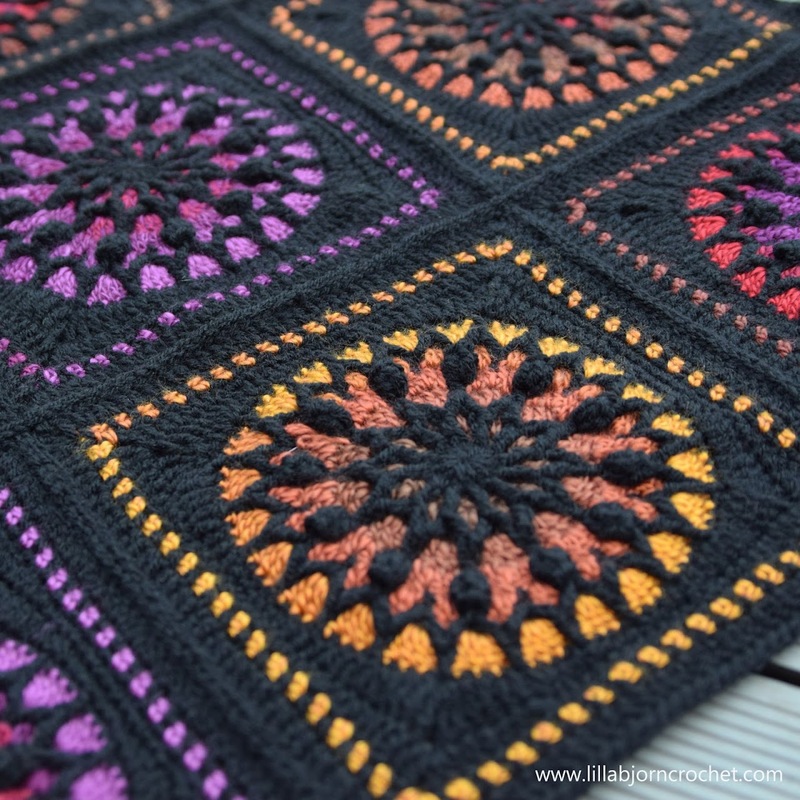 Stained glass crochet can be practiced with different colors, but black always looks the best – perfectly framing other shades and making them pop-up. White color also gives a very interesting effect. I gave it a try and designed my own stained glass square. It has not been released for a while because I didn’t have a perfect name for it. I am so grateful for your response in my FB group, and for 800+ suggestions. Many of them referred to Stained Glass, and this is how I wanted to call the pattern from the beginning, as it is type of crochet. Some names were inspired by Cathedral windows, and orange color - sunset, volcano, sun... I LOVE them all. But I really like the one about lantern :) And decided to name my new pattern Stained Glass Lantern. Isabel Cress, Andrea Muller and Jay Bray suggested "lantern". Thank you very much! And I also liked "windala" by Bettina vag der Jagt. I might steal this name for future designs. The pattern is available on Ravelry HERE and Etsy HERE. Stained glass crochet projects are wonderful stash busters. You only need enough yarn in one color for patterning and background can be made with leftovers in different shades. 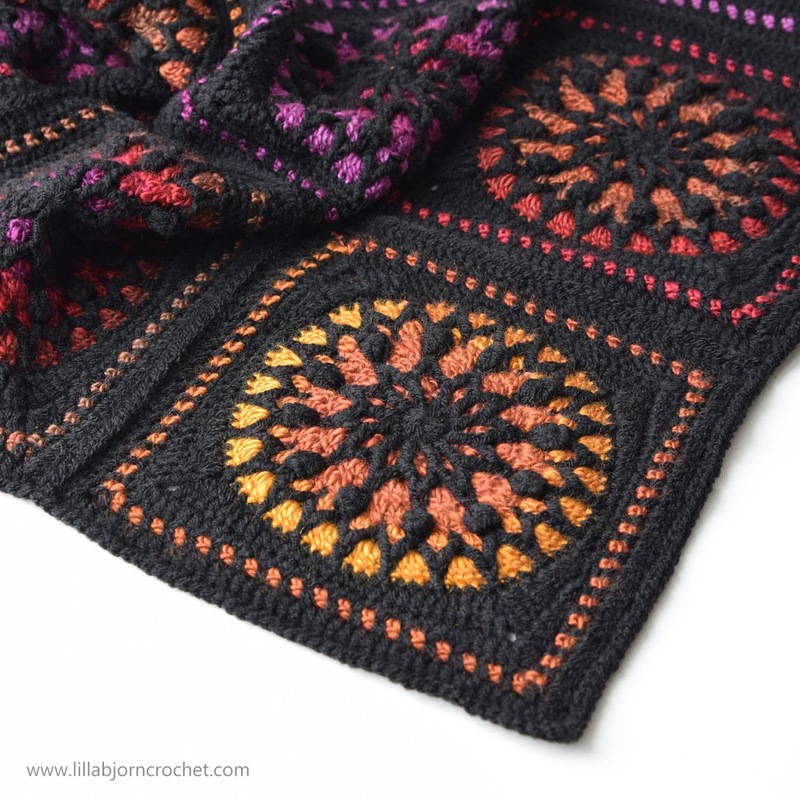 And of course stained glass crochet is perfect for variegated yarns – with long or short color repeats. For my own Stained Glass Lantern blanket I used what I had in my stash: two skeins of black Colour Crafter* (1002 Ede) and two skeins of Wanderlust* (467 Amsterdam). And four skeins in total were enough for 70cm x 70cm (27.5”) baby blanket. Of course, it is possible to make it in any size. Each square requires approx. 25g of Colour Crafter and 15g of Wanderlust (with 4mm (US6/G) crochet hook*) and measures approx. 23cm (9”) after blocking. I like the idea of using variegated yarn as with only one skein you get a kaleidoscope effect. Amstedam shade of Wanderlust has hints of purple, red, yellow, orange and brown. And it makes each square looking different. Stained Glass Lantern pattern is not tricky and if you are advanced beginner, you can absolutely take the challenge. Each round is worked with one colour only, and with variegated yarn there are almost no ends to weave in. Instead the yarn in carried on the back of your work from one row to the next one. I was very curious to try the same pattern with white main color, and leftovers in different shades, and here is a pillow I made. All with different colors of Colour Crafter. Hilde Tindlund was helping me with the test and opened her Catona box of cutie pies* especially for this project. Hilde mixed mini skeins of Catona with different shades of Stone Washed* yarn by Scheepjes, and her squares look so charming! My personal favourites are the ones made with Smokey Quartz color. It was meant to be a pillow but I am secretly hoping Hilde will make more squares and join them together into a blanket. 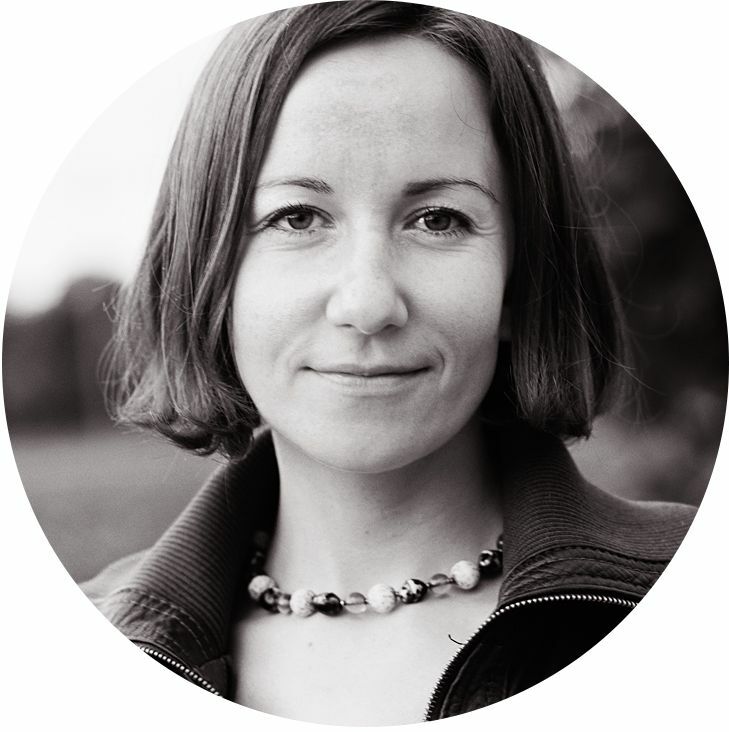 And Laura Jackson (again!) used the pattern in a very creative way. 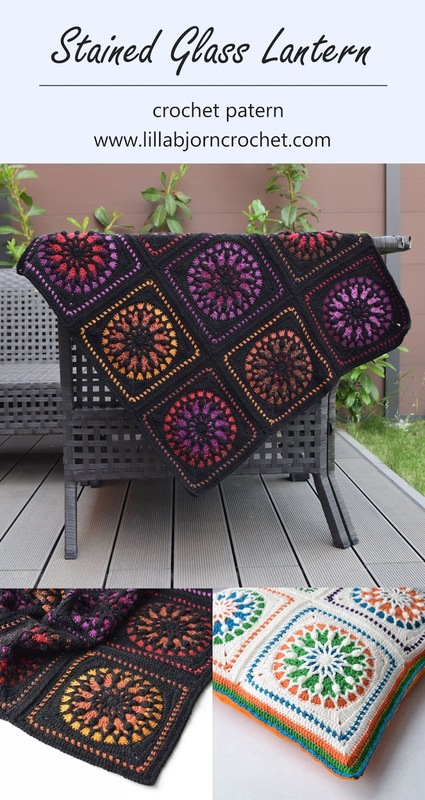 She enlarged two squares by repeating several rounds, and joined them together with original squares into an asymmetric blanket. Jump to Laura’s Ravelry page HERE to read about all adjustments of the pattern she made. And what about you? :) Do you like stained glass crochet? Have you tried it? Would you use black or white color for your own project? Fantastic pattern! The effect of stained glass is beautiful. Just a note: there's no link in the text "Jump to Laura’s Ravelry page HERE" (and I couldn't find her with a Ravelry search). Hi Kate! Thank you!! Yes, the link was not active because Laura's project was not up on Ravelry at the time of posting. But now direct link was added. 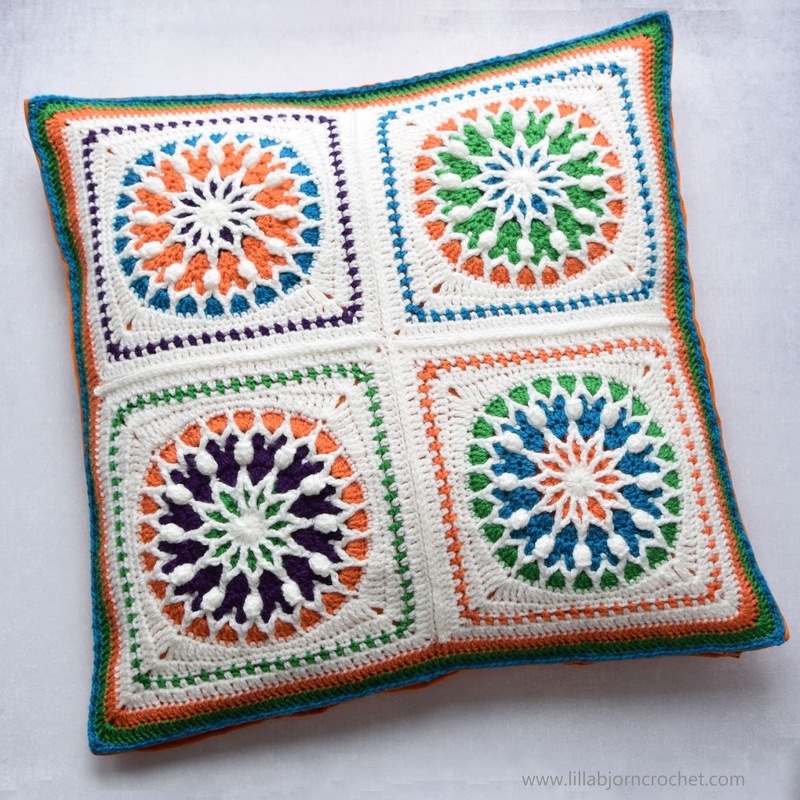 ooooh this is soooo beautiful and I love this type of crochet. I can't wait to make my own creation. Hi Jenny, stained glass windows are wonderful, I agree! 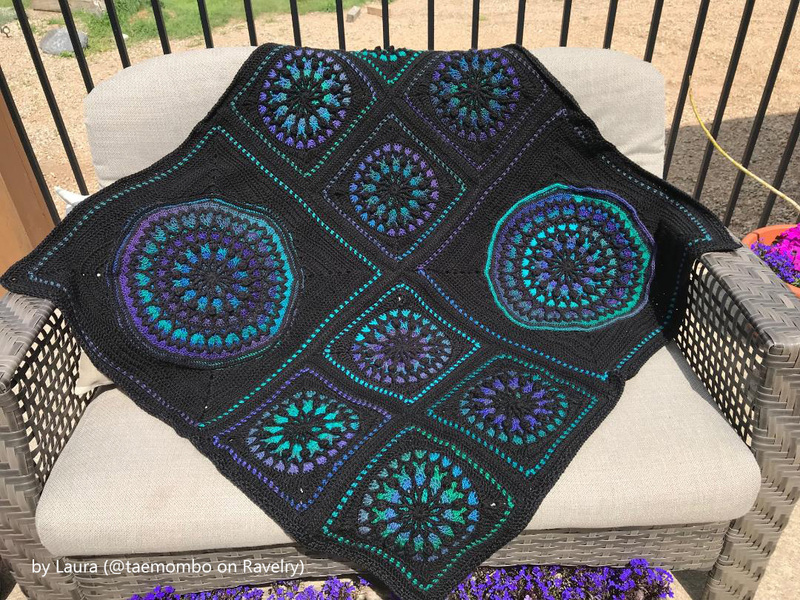 I shared the link to your post on a Facebook Mandala Yarn group I belong to. So beautiful! You create such lovely patterns. Did I miss something? I was looking and have read through several times and can't find a code for the discount. The discount was only available during the first weekend after release. And there was no code. The blocks are beautiful, I love �� them! The colors are just stunning. Thank you for the beautiful pattern. It´s so beautiful :) Love this blocks.....But it seems so difficult?? 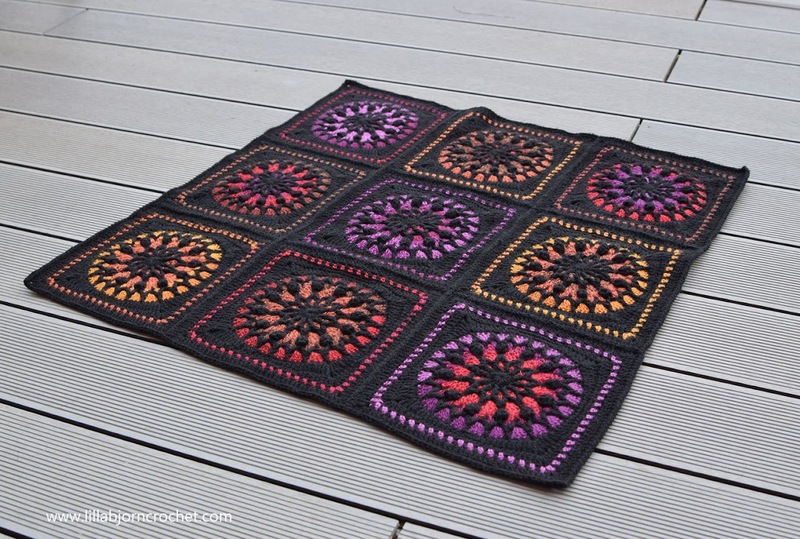 I couldn't do the black background, which is the one that rings true for me, because I mainly crochet under artificial light but I love Hilde's stone washed squares, so I might try doing something similar to that. Thank you for some great designs!